When our oldest was twelve, we started allowing him to stay up later on weekend nights…only to discover the ‘Sunday morning slump.’ He wanted to sleep in. We wanted him to get up. He had not yet discovered the enthusiasm of rising early for church. You know how that goes. You call them to wake up…repeat it three more times. Each time both of you are getting more agitated. So where did I go for wisdom? How did I solve this problem? I hit my knees to ask my Father the best way to draw a twelve year old son to Him. I was reminded that at age twelve, Jesus lingered behind at the temple…not wanting to leave! Quite the opposite scenario I was facing. Surprisingly the Lord provided a very practical antidote for the lure of sleep. The lure of freshly baked cinnamon rolls…eight to be exact. The aroma floated through the air and reached him…drawing him out of bed with anticipation. A family of five has to be creative with eight cinnamon rolls to divvy up. Thus the ritual of Sunday morning cinnamon rolls began in the Thompson home thirty three years ago. This ritual is still being repeated to the third generation today. Waking up was never an option, but how to invoke a right attitude, when getting up, was the challenge. God’s wisdom once again proved true. Is it possible God may have a practical answer for a complicated dilemma you face? Can you share something God has shown you that has been effective, when nothing else seemed to work? p.s. 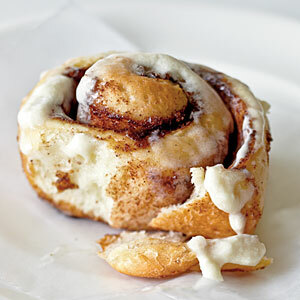 .The powerful cinnamon rolls were actually Pillsbury in a can.